Translated to English/French! Complete early KMS and good 3D support; copy-to-RAM options at boot. Linux 2.6.35.8 kernel, X.org 1.9.2. Released on 2010/11/03. 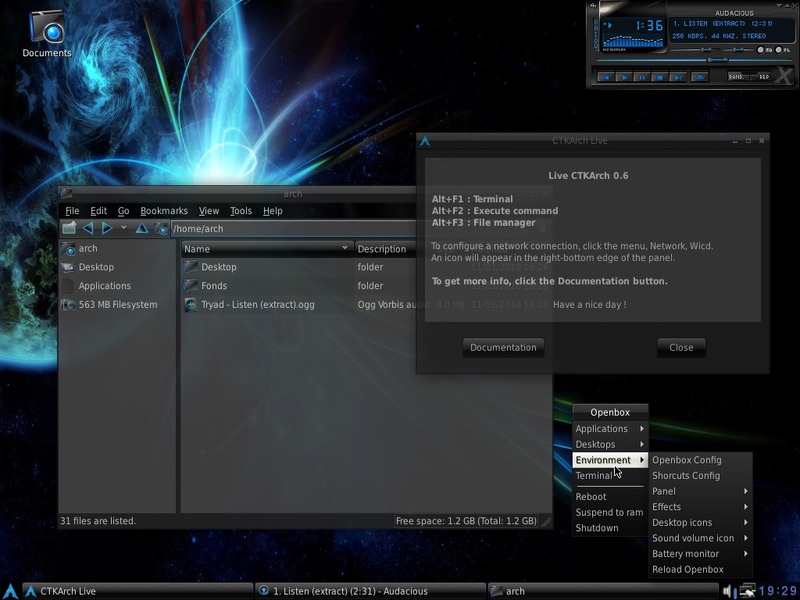 The live is copiable to RAM at boot and when running, along with the add-ons and the home&apos;s partition personal folder, to remove the media and continue using the computer. HAL deleted, now using udisks, upower… to manage the same functions with Udev. Updates should work much better than with v0.5: initscripts, pcmanfm, fbpanel, nouveau, etc… now come from the Arch repositories. By default, repositories are frozen to the release date of the Live, to allow installation of new software without necessarily updating the system. To get back to the rolling release update system, you&apos;ll just need to comment out/remove the ARM line in /etc/pacman.d/mirrorlist. Installer rewritten; BTRFS support at installation. The default font becomes DejaVu Sans Condensed. Problems with web browsers&apos; widgets and the dark theme solved. Thanks to Fabien Rendu (aka Coolgeek) for the lightweight GTK welcome dialog.